With research topics ranging from understanding relational maintenance and dating, to learning about nonverbal deception and lying, communication research has produced findings that may profoundly enhance our daily lives if we understand them. 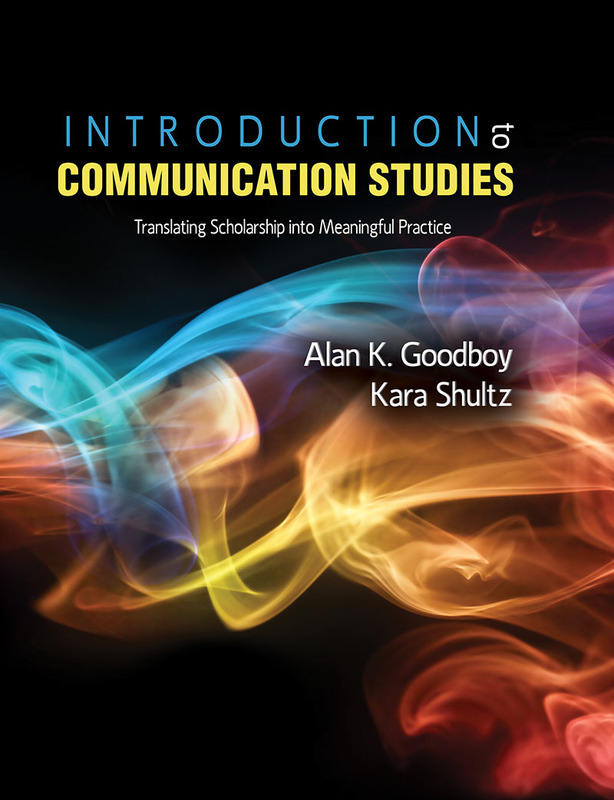 The authors of Introduction to Communication Studies: Translating Scholarship into Meaningful Practice believe that students who are introduced to the communication field for the first time should leave their introductory course with practical knowledge they can actually use in their daily lives. Introduction to Communication Studies: Translating Scholarship into Meaningful Practice goes beyond most introductory textbooks written for the “basic course” that typically focus on public speaking, group communication, and interpersonal communication. Introduction to Communication Studies: Translating Scholarship into Meaningful Practice is an edited volume of articles that translates entire research programs of complicated findings into simple real life practices across the major communication contexts. Thus, creating an effective communicator in a variety of real life situations and contexts! Helps the reader understand important communication research findings published in peer-reviewed journals. Features 44 brief mini-chapters that highlight major programs of communication research written by the most famous experts who are noteworthy scholars with impressive research agendas. Provides the reader with better “take-aways” from an introductory course, shows him/her a good cross-section of the state of the art research that is being conducted, and gives the reader practical real life advice grounded in scholarship. You will receive access to this electronic text via email after using the shopping cart above to complete your purchase. How can online daters be more successful in meeting a potential romantic partner? What perceptions do people form after viewing Facebook profiles? What are we giving up and what are we risking when we disclose our private information online? What are the most effective ways for individuals to manage conflicts? How do demand/withdraw patterns affect family members? What are major conflict issues in the workplace and how can workplace conflict be managed more effectively? How do we talk to children about healthy lifestyle choices? How do siblings communicate to remain close throughout the lifespan? What roles and what impact do topic avoidance and secrets play in family relationships? How might feminist ideals help us to shape a more civic public discourse? How do the popular media script our bodies, our race, and our gender? What is queer theory and how can understanding it help us to better understand our own sexual identity and the ways in which our prejudices influence our interactions with others? What theories and concepts explain the communication and behaviors of peer groups, where members consider one another to be equals in some relevant way? What effects do coaches’ communicative messages have on their athletes/teams? How can we have better decision-making in small groups? How can we use health communication inquiry to enhance health outcomes? How can we keep kids off drugs using communication? What roles do science and medicine play in constructing our views on illness and our role as patients? How can we best increase our intercultural communication competence when we encounter people from different international cultures during travel, study, or business interactions? What are the ways in which culturally distinctive practices get woven into international and intercultural interactions? Given that highly racialized society that we live in, how do we communicate more successfully in this context? How can we keep our romantic partners happy by using relational maintenance? How do we experience and respond to jealousy in romantic relationships? How can we have better first dates? How can students craft more competent emails to professors? How can students better cope with public speaking anxiety in the college classroom? How can students communicate effectively with their teachers? In what ways is the proliferation of interactive media (scanning your grocery card, casting a vote on American Idol, and purchasing the latest phone app) and reality television programming damaging our ability to enact citizenship in our democracy? How does violent video game play affect individuals’ thoughts, feelings, and behavior? How do representations of cultural others in popular media shape our understanding of ourselves and our place in society? How can we tell if someone is lying to us? Which nonverbal cues are effective when flirting? Which nonverbal skills are important for communicating competence? What issues cause employee dissent in the workplace and how do employees dissent? What is the meaning of work and how do we make work meaningful? How can we sustain commitments to the work and personal aspects of our lives? How do evoked emotions affect our attempts to be persuasive? How can we increase the success rate of compliance requests? How can we use powerful (and avoid powerless) language to persuade others? How can we, as citizens of democracy, engage productively with others despite our political differences? How can we encourage college students to participate in a more political life (e.g., voting)? How does campaign communication influence who we vote for? How and why might one assume the role of a tourist-critic when visiting places of public memory? What are far-reaching practical consequences for the genetic revolution in terms of prenatal testing, new drugs, and new agricultural products? Why should we all engage in critical civic discourse? Alan K. Goodboy (Ph.D., West Virginia University, 2007) is an Associate Professor at West Virginia University. His research interests focus on instructional communication (e.g., instructional dissent) and interpersonal communication (e.g., relational maintenance). His research appears in such journals as Communication Education, Communication Quarterly, Journal of Applied Communication, Communication Research Reports, and Communication Reports, and in several other journals. Kara Shultz is a Professor and Chairperson of the Department of Communication Studies at Bloomsburg University of Pennsylvania. She teaches a variety of courses in rhetoric and public advocacy and intercultural communication. Her research explores the use of rhetoric in constructing and contesting identity for marginalized cultural communities. Her essay “Every Child a Star” (And Some Other Failures): Rhetorical Trajectories of Guilt and Shame in the Cochlear Implant Debates” appeared in the August 2000 Quarterly Journal of Speech. In addition, she has a co-authored article that appeared in The Howard Journal of Communication (1998, July-September); two book chapters in the edited volumes Conflict and Diversity and Handbook of Communication and People with Disabilities; and an article “On Establishing a More Authentic Relationship with Food: From Heidegger to Oprah on Slowing Down Fast Food” in the forthcoming book on The Rhetoric of Food.